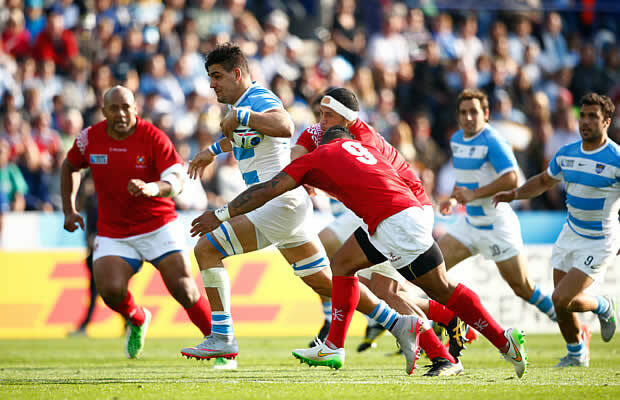 Argentina powered their way to a 45-16 bonus point Rugby World Cup victory over Tonga that has almost assured them of a place in the quarter finals. 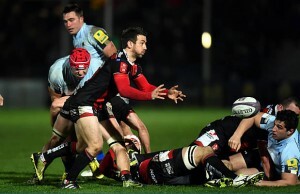 Tries by Joaquin Tuculet, Juan Imhoff, Nicolas Sanchez, Julian Montoya and Santiago Cordero — often with brilliant darting runs — sealed the result. Kurt Morath’s sixth-minute try put Tonga ahead with a move he started and ended. Tonga were soon behind and chasing the game. The more accurate Sanchez kicked a penalty after 19 minutes and Tuculet got Argentina’s first try soon after, exposing the Pacific islanders’ defensive frailty. 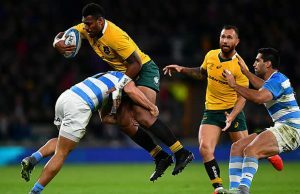 But Tonga threatened a fightback when Telusa Veainu staged his own breakthrough on the wing and got the ball to Soane Tonga’uiha for their second try. Morath pulled the conversion wide to the annoyance of coach Manakaetau ‘Otai. Just after the hour, Sanchez got the ball 15 metres out, handed-off one opponent and burst through for Argentina’s third try. Sanchez’s 25 points took him to 51 from three games, ahead of Japan’s Ayumu Goromaru as the tournament’s leading scorer.